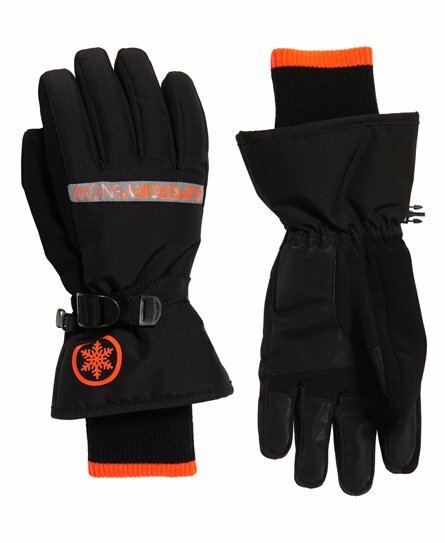 Superdry men’s Ultimate Snow Service gloves. Hit the slopes in style with the Ultimate Snow Service gloves. Comfort and performance have been combined in the design of these gloves, which have been crafted from a highly breathable fabric and feature technical reinforced palms for improved grip. Waterproof inserts and a weather tolerant coated fabric means your hands will stay dry as you ski and the super soft interior adds a touch of warmth and luxury. The gloves are completed with an adjustable strap, goggle wipe on the thumb and forefinger and a Superdry Snow logo badge on the wrist and Superdry Snow logo across the front.